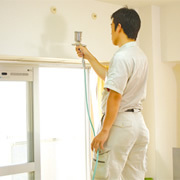 Application method | SELFEEL | Products | NICHIRIN Chemical Co., Ltd.
SELFEEL is directly sprayed onto the wall and ceiling with nozzle working compressed air. Particular preparation for the application is not necessary and furniture can stay where they are. Therefore, it can be easily applied to the rooms where you are living now. The effect depends on the size of contacting area of the applied SELFEEL with the environmental atmosphere, and so the application without arranging the furniture may be more favorable. Time required for the application is approx. 2 hours for a floor space of 80m, so the work will be quickly accomplished while you are out for shopping. To play videos, you need a browser that supports video tags. 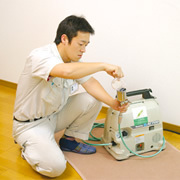 The following equipments will be brought into the application site. Because they don't take up space, it is not necessary to provide an extra free space. Copyright © 2002-2019 Nichirin Chemical Co.,ltd. All Rights Reserved.